Is The Future Of Video Games Streaming Online? It was a given that as bandwidth increased across the web, that video games would be a big part of the content produced and streamed. And today those games are monster revenue makers and will not be stopping anytime soon. These games range from simple to sophisticated examples of the latest in special effects wizardry. You’ll find famous actors, directors, technicians, and composers lending their talents to many of these games and there’s a good reason, the overhead to produce them is lower than feature films but the return on investment can be far more than any major feature film. Such is the case with the Call of Duty franchise. Billions of dollars. The Bioshock franchise is another one that brings in the cash and of course the Dark Knight, Batman has a series so powerful it rivals its movie counterpart. Matter of fact the Batman Arkham series, Arkham Asylum, and Arkham City aren’t based on the movies by director Christopher Nolan but are separate stories in themselves but have brought in as much money as the movie franchise. Clients who stream games are of course XBox, Playstation, and Steam as the heavyweights. Each company sells games, provides multiple forms of content and services. Steam, the 300lb gorilla here, sells games and provides online venues under one of the most complex security protocols. They’ve been hacked like Playstation but Steam’s loyalty base isn’t going anywhere as frustrating as the company can be. Bandwidth and service are the key here, Just look how Apple are bumping up their infrastructure to cope. There’s enough content for sure and more on the way. The future of streaming video games keeps getting brighter. A trend that currently seems to be developing off the back of a glut of superhero movies in theatres is a wave of new spin-off TV series set in that comic’s universe, as recently demonstrated by new Marvel series Agents of S.H.I.E.L.D. (based around The Avengers franchise) on ABC. It appears as though rival network Fox are the latest to get in on this action, though, with confirmation that Marvel’s rival comic creators DC have, via Batman film rights holders Warner Bros., sold the network a made-for-TV prequel series Gotham. 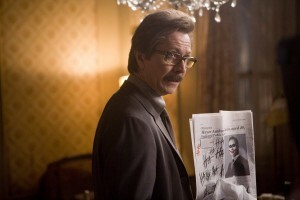 Looking to jump-start the process by having enough faith to bypass the pilot phase of new show creation, the show will cover the backstory of ‘Commissioner Gordon’ (the chief of police that often calls on Batman’s assistance), as the younger ‘Detective James Gordon’, who has not yet met the hero (with the ‘Batman’ character not expected to have any part in the story). 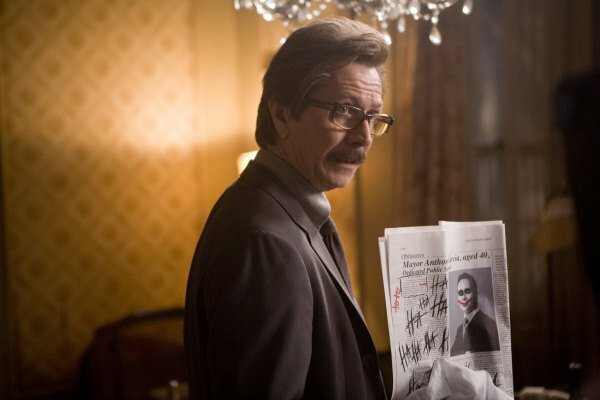 This leaves Gordon having to perform his duties whilst the city is becoming overrun with “the villains that made Gotham famous”. Aside from a presumed 2014-15 TV season premiere date, little else is known about the new show other than that writing duties will be performed by Bruno Heller (The Mentalist). The rest of the show’s details, meanwhile, will have to be filled in and put into practice relatively quickly (presumably within the space of a year) given the straight-to-series order. Someone once said that if Facebook put a search engine box on their site Google could go out of business. Well how about if they started a movie streaming service? That is now happening, Facebook are experimenting a streaming movie service that may be a forerunner to a full blown service. 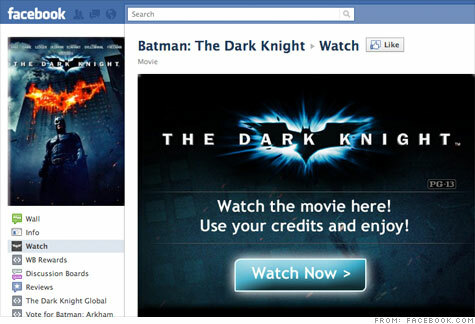 They have signed their first ever Hollywood deal with Warner Bros. and are now offering The Dark Knight for rental. The cost will be $3 or 30 Facebook Credits to rent the film for 2 days and you watch while doing the all important social networking. The service is a test say Warner Bros, and is part of a campaign by the Hollywood studios to get a foothold in the digital streaming market as they take on Netflix and co. As revenue from DVD sales continues to fall, they are looking at other ways to monetize their product. 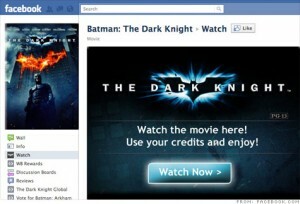 Facebook say that the deal is being pushed by Warner Bros. as a developer and that the social networking group were “open to developers and partners that want to experiment using Credits in new and interesting ways.” However it goes, Facebook will be smiling making 30% of revenue. They enter a lively market currently dominated by Netflix and Apple with a new entry coming from Amazon. One thingh is for certain, if Facebook get serious about digital movie hire/subscription then we will have a fight on our hands.